Let me start off by saying that when I can’t find that funky Craft Beer stuff that I love so much I usually reach for one of Sam Adams’ products. While most of the Boston Beer Company’s stuff won’t blow your mind it’s also almost always fresh and well balanced. Given that Sam Adams is my fallback beer I thought I had tried all of their normal regular and seasonal offerings. I was pleasantly surprised to find that I was wrong the other night when the Alemonger hit me with a Sam Adams Noble Pils. Aroma: Crisp strong citrus aroma with hint of spring flowers like beer made from honeysuckle blossoms. Taste: Medium carbonation. A crisp and clean taste with all things in balance. Little bitterness in the first sip or aftertaste. This offering is the perfect end of winter/springtime brew. After a cold winter made easier to bear with dark Porter’s, Winter Warmers, and Christmas Ales this is the perfect transition into spring as the winter warms up. While my first taste at the Alemonger‘s was the bottled version during a social session my second tasting was where this brew may be at it’s best. The second sip was the draft version served alongside a Chopped Pork Sandwich dripping in Devil’s Spit spicy BBQ sauce over lunch today at Famous Dave’s BBQ. While Famous Dave’s BBQ is not the best BBQ I have ever had (or in the top ten) it is a good fix for when I am jonesing for the BBQ I used to get when I worked in the South. They make a good spicy “heat ‘n’ sweet” BBQ sauce (Devil’s Spit) that needs a cold crisp beer to round out the meal. Noble Pils was more than up to that task and I can’t wait to pair it with some of my own BBQ when the snow is melted and spring has sprung. Beyond BBQ try the Noble Pils with spicy Thai food, lighter grilled food, or just as a session brew with good friends. I think you’ll like it and I give it a solid B+. Your review was spot on. This beer is terrific on a hot day with the BBQ going. Not usually a Pilsner guy, but Sam Adams has changed that with this beer. Yup, this stuff would one of the beers of choice for a hot day or killing the heat of spicy grilled food and is a great expression of a Pilsner. This makes me wonder why Sam Adams has chosen to only brew and release this from January to March. Is this one of their newer beers? Maybe their just doing a test market thing to see if it takes off. Just a thought. They have been making this since 2009 as one of their seasonal brews so I don’t think this is a test marking thing. They have however been marketing this stuff pretty heavy with this release. FIL and MIL stopped by to drop off some VD cupcakes for the boys. Since FIL is usually a Sam Adam’s hater (FIL says, “It’s got that bite at the end that I just can’t get into.” Or something like that. ), but a lager/pilsner lover, I thought I would offer him a sample of this seasonal brew (part of a Foodery, “for research purposes only”, mixed six that I picked up at lunch this afternoon). And since I’ve never had it either, I figured I may as well join him. I am happy to report that we both enjoyed this beer! Crisp, clean, refreshing. Lots of floral hops. Lovely citrus finish. This beer has Spring Fling Pig Roast written all over it! Our Iowa friend said it best… your review is spot on! I eagerly await the Victory Prima Pils review and sip-by-sip comparison to the Noble Pils. I have had both but I will reserve my opinion and work it into a snarky comment to your review. And YES! Noble Pils + Roasted Swine + Spring = FUN! There won’t be a sip-by-sip comparison unless I run out and grab another bottle of the Noble Pils. I suspect that they will be evenly matched since the Prima Pils has a good reputation. I’m a big fan of this Sam Adams seasonal – lots of great hops and a great transition beer between their Winter Lager and Summer Ale. Although Noble Pils isn’t my favorite seasonal (you can’t beat Sam’s Oktoberfest for great all-around autumn flavor), Noble Pils is a close second. I agree that this is #2 in Sam Adams seasonal rotation behind their Oktoberfest but it fills a unique spot in the brewed universe. While the Oktoberfest is probably the best seasonal Sam Adams makes it is not the best Oktoberfest in the class with many other brewers producing their own “Fest Beer” incarnations. The Noble Pils seems to be creating a new seasonal class, the Spring Transition beer. 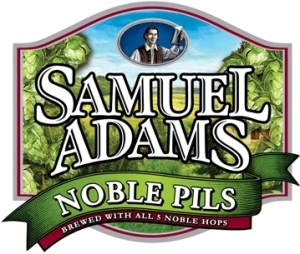 While most brewers are going right from their heavy winter warmers and Christmas ales to their summer beers Sam Adams, with the Noble Pils, has created a brew to ween you off of that heavy stuff and transition to lighter summer flavors …. Now if it also helped me to lose the 10 lbs I put on this winter it would be perfect. As a big fan of Sam Adams, I jumped at the chance to get a last taste of the Noble Pils before this seasonal runs out. As the Wookie, has indicated this was a great transition beer as the weather has finally offered us a glimpse of Spring.